The DigiPure 9000S Countertop Water Filter System is an easy to install solution for customers that can't permanently install a water filtration system. The 9000S is also portable, making it a great choice for anyone that travels or has more than one house. Advanced digital control circuitry to accurately monitor cartridge life with LCD Display. Audible alarm sounds to indicate when cartridge or battery replacement is necessary. Easy connection with most kitchen faucets. Accepts most standard 9-3/4 x 2-1/2" carbon filters or ceramic filters. 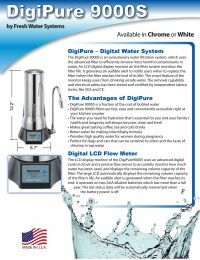 The LCD display monitor of the DigiPure 9000S is equipped with a digital control circuit coupled with a precise flow sensor to accurately monitor the volume of water used and the remaining volume capacity of the filter.